St. Martin's Paperbacks, 9781250190727, 480pp. Dodge City, Kansas, is a place of legend. The town that started as a small military site exploded with the coming of the railroad—its streets were lined with saloons and brothels, its populace thick with gunmen, horse thieves, and desperadoes of every sort. By the 1870s, Dodge City was known as the most violent and turbulent town in the United States—until Wyatt Earp and Bat Masterson, two young and largely self-trained lawmen, led the effort that established frontier justice. 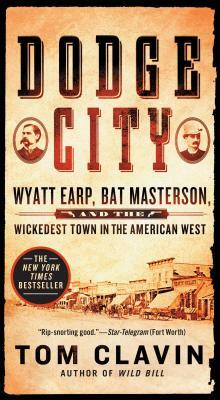 This larger-than-life account of Wyatt and Bat’s adventures throughout the West—and the characters they encountered along the way (including Wild Bill Hickock, Jesse James, Doc Holliday, Buffalo Bill Cody, John Wesley Hardin, Billy the Kid, and Theodore Roosevelt)—offers an “absorbing…fun and revealing” (Wall Street Journal) look at a wildly entertaining chapter in American history that no reader will soon forget.